Illinois Army National Guard Sgt. Wesley Todd is amazed—and thrilled—to be an inventor. While working on a light-towed howitzer cannon, Todd invented a device that improves soldier safety and equipment longevity to the extent that it is projected to save taxpayers hundreds of thousands of dollars, perhaps more. The invention—which facilitates the removal of seized muzzle breaks from cannons, thereby eliminating the need for excessive force that can damage equipment—has been approved and is being tested before its possible implementation throughout the U.S. Army. Maj. Gen. and Adjutant General of the Illinois National Guard Richard J. Hayes said Todd’s invention will affect the Army in more than a small way. 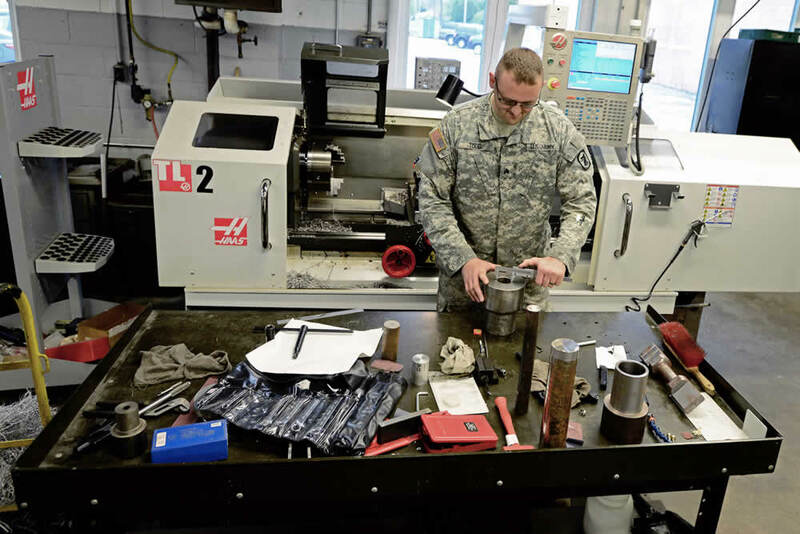 Chief Warrant Officer 2 Steve Murphy, armament supervisor at the North Riverside CSMS, said Todd took it upon himself to design and fabricate the device when he saw soldiers struggling to remove a seized-up muzzle break on a light-towed howitzer. Todd used a computer numerical controlled lathe to make the piece that is 6 inches in diameter, 7 inches in length and weighs about 30 lbs. It bolts onto the end of the muzzle break, sliding into a notch on the muzzle, and then soldiers use a breaker bar by placing it in the hold and applying pressure to loosen the muzzle break. This eliminates the need to use the kind of force that could damage the howitzer tube or its rifling grooves when removing seized muzzle breaks. Just the tube of the light-towed howitzer can cost more than $265,000. Staff Sgt. Robert R. Adams is with the Illinois National Guard Public Affairs Office.